Welcome to Part One of Light Blue Comps and Dupes! 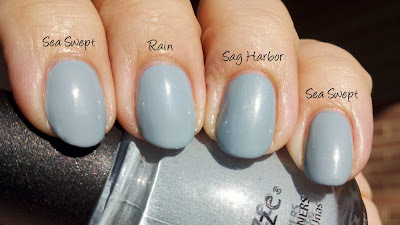 I wanted to compare the new China Glaze Sea Swept for you, so you would know if you "need" it! There is nothing worse to coming home and realizing you have two of the exact or almost exact color! 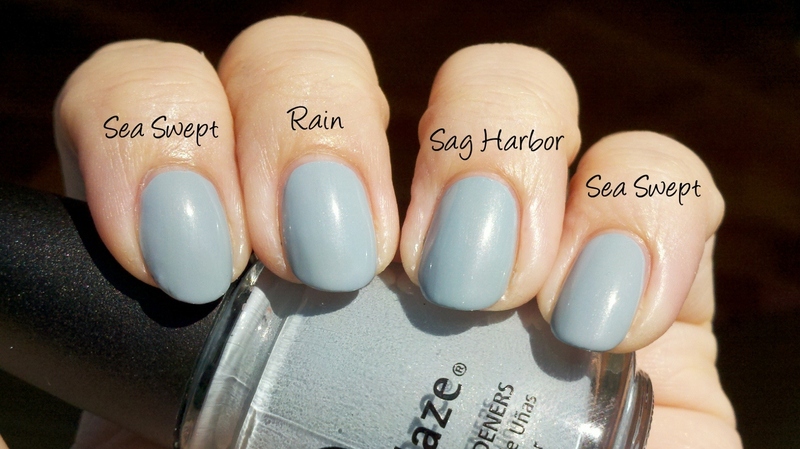 Eyeko Rain and Essie Sag Harbor are the closest, although Sag Harbor has a bit more shimmer. Sea Swept is slightly more grey than the other two. Formula wise, none of them were great, but that is to be expected in a pastel shade. So if you have Rain or Sag Harbor, do you need Sea Swept? No, but it would be great to have!